38178 Metal Spiral Candleholder home decor, jewelry, decor, decorations, electronics, fountains, floor mats, art glass, vases, garden essentials, fireplace screens. Crown any tabletop with a shimmering spiral of golden light! 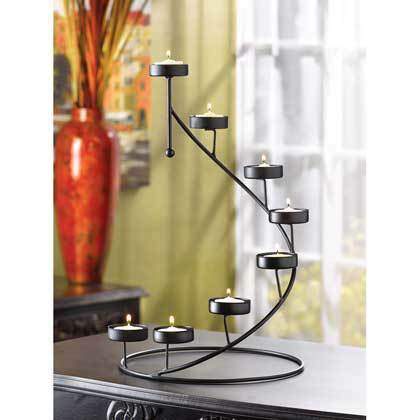 Matte-black candleholder cradles eight tealight votive candles in a breathtaking stair-step display. Dramatic alone, or circle around a vase of fresh flowers for an instantly elegant centerpiece! Metal. 9 7/8" diameter x 15" high. Tealights not included.